Varieties of watermelon in India. A melon is any kind of edible, fleshy fruit in the Cucurbitaceae family. Many different cultivars have been produced, especially of muskmelons. Botanically speaking, the melon is a fruit, but some kinds are often considered vegetables. Most melons belong to the genus Cucumis, but there are also some that belong to Benincasa, Citrullus and Momordica. The muskmelon belongs to Cucumis, while the watermelon belongs to Citrullus. The word melon comes from the Latin melopepo, which itself comes from the Greek μηλοπέπων (mēlopepon). Melons come from Africa and southwest Asia. They gradually began to appear in Europe toward the end of the Roman Empire. Melons were introduced to America by early settlers, who grew honeydew and casaba melons as early as the 1600s. A number of Native American groups in New Mexico have a tradition of growing their own kinds of melon cultivars, derived from melons originally introduced by the Spanish. Melons are a nutritious food. 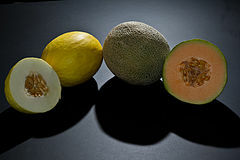 The seeds of cantaloupe were used in China to moderate fevers and the digestive system. Elsewhere, seeds were ground into a powder and used to treat tuberculosis. Cantaloupes are particularly beneficial to people with heart disease, as they have large of amounts of an anticoagulant known as adenosine. They also have high levels of potassium, which benefits those with high blood pressure. Due to their high water content, all melons are considered diuretics. There is also evidence that suggests that eating melons can lower the risk of cancer. USDA researchers discovered that melons have lycopene, an antioxidant found in a select group of fruits and vegetables. Lycopene treats and prevents cancer by trapping free-radicals in cells. ↑ John Griffith Vaughan, Catherine Geissler (2009). The New Oxford Book of Food Plants (second ed.). Oxford University Press. p. 134. ISBN 0-19-954946-X. ↑ 4.0 4.1 "Growing Melons". University of Nebraska-Lincoln Extension. Retrieved 2011-11-04. ↑ Denise Miller (24 September 2008). "San Felipe Pueblo melon farmer favors the old ways". Albuquerque Journal. ↑ "Melons: The Native Americans". New Mexico Fruit Growers. 30 September 2010. "Cucumis melo L." Purdue University, Center for New Crops & Plant Products. "Sorting Cucumis names". Multilingual multiscript plant name database. "Melons". The Cook's Thesaurus. . List of photographed varieties of melons. "Growing Melons, Makings, Tips - A Grandfather's Tenets". Melon Growing Guide. Agriculture Guide. 7 June 2011. This page was last changed on 31 August 2017, at 07:46.